As it gears up to prepare for the mega sporting event, Russia is manufacturing driverless trucks with off-road capability in time for the 2018 World Cup. Russia plans to unveil trucks that will drive (manoeuvre) themselves when it hosts the FIFA World Cup in summer 2018. Russia’s Deputy Prime Minister Arkady Dvorkovich made this interesting announcement at the STS Forum in Kyoto, Japan, earlier this month. What exactly the vehicles will do during the event have yet to be specified. Russian car manufacturers have entered the race to build self-driving cars, and they plan special features that no competitor will offer. The playing field in this competition is already crowded by the titans of auto-manufacturing. In October, Toyota announced plans to bring self-driving cars to the market by 2020, the year of the Tokyo Olympics. Daimler recently tested its self-driving tractor-trailer on public roads in a suburb of Stuttgart. Meanwhile, Honda, Tesla Motors and BMW are currently testing their driverless cars in California, one of the few places in the world where no regulatory restrictions exist for such vehicles. “We started developing our remote-controlled vehicle project based on cars produced by the Urals Automotive Plant and, provided that some government assistance is available, we will be able to develop this project further and get a vehicle with full-fledged remote control and self-driving capabilities by 2018,” said Elena Matveeva, Gaz Group vice-president. 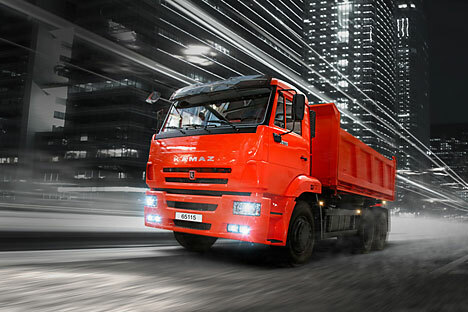 KAMAZ has already received around $4.6 million in funding from Russia’s Ministry of Education and Science. The company is developing its driverless truck jointly with Russian software developer, Cognitive Technologies. Olga Usova, president of Cognitive Technologies, told RIR that the company was planning to produce its first prototype trucks at their factory in the Russian city of Naberezhnye Chelny. “Our driverless KAMAZ truck is currently capable of performing the more simple manoeuvres; turns, U-turns, moving in a serpentine pattern, and stopping in front of obstacles,” said Usova. Most international competitors are working on cars suited primarily for ideal traffic conditions and high-quality road surface markings, but Cognitive Technologies is taking the harsh conditions of Russia’s road network into account. The KAMAZ and Cognitive Technologies project is based on the so-called passive, or signal-acquiring computer vision. This means that the vehicle’s computer vision system acquires data from the outside, and this data is then processed by the vehicle’s artificial intelligence to make decisions. According to Usova, this is the project’s main feature, distinguishing it from most other driverless cars, including the Google Car, which are based on what she calls “signal-emitting design.” This concept involves using additional devices, such as radars, which use reflected light to measure distance, as well as various sensors. Cars of this kind navigate by emitting signals that reflect from the environment. The U.S. and Europe are currently constructing smart highways, which come with perfect road markings and built-in sensors providing information about traffic. “This is the ideal environment, and our vehicle is also able to use radars but thanks to the algorithms implemented in our truck it can operate in Russian conditions, as well as on most of the world’s roads,” Usova said. Cognitive Technologies believes that its self-driving KAMAZ truck project will make Russia one of the leaders on the international automobile market, especially in developing countries where the quality of road markings remains poor. World Cup 2018: self goal or bonanza?